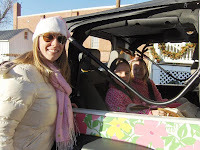 Maryland Pink and Green: Riding the Lilly Jeep in the Parade! 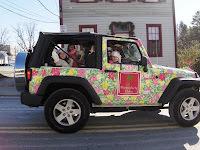 On Saturday, my dear daughters had the wonderful opportunity to ride in the Lilly Jeep in a holiday parade in Leesburg, Virginia. The Jeep was sponsored by a lovely Lilly store called Persnickety Palm. The weather was gorgeous and not too cold, so it was a perfect day! We got to the store bright and early to meet Persnickety Palm owner Linda and Ashley from Lilly Pulitzer corporate. My daughters instantly fell in LOVE with Ashley and proclaimed her as being "so cool and FASHION!" Here my minnies pose in the Jeep with Ashley. We went to find a good parade spot on King Street to watch the festivities and were so happy to see the Jeep headed our way! The girls were giving their best "parade wave" and the expression on their faces was priceless! Linda had given the girls pink and white Santa hats to wear and reindeer antlers with pink ribbons on them. It was too cute! After the parade, the girls posed with their friends and Ashley in front of the Jeep! They were thrilled to wear their new Lainey dress from Resort and it kept them so warm. Moms and grandmas, RUN to get a Lainey for the minnie in your life. The dress is an incredibly comfortable velour fabric and is perfect for school or the playground. My girls wore leggings with their dress and UGG boots, but it looks great with tights for a dressier look. Persnickety Palm had lots of in store specials on Saturday. I was lucky to get a beautiful patch Lilly stocking and other goodies when I picked up some of my resort favorites. Keep reading the blog and look for a special giveaway later this week! Be sure to vote in my Lilly Pulitzer dress poll. Too cute! 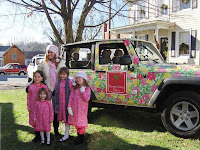 Of course I only have boys... but I'D LOVE to ride in that Lilly Jeep. What an amazing Christmas treat! How fun! What a treat for you and your girls! That must have been so much fun! I LOVE the photo of you with your daughters in front of the jeep--just precious! I'm having fun getting to know you and reading your blog. Thanks everyone!! I love this time of year because there are so many fun things to do! Have a wonderful day! Hi there fellow Marylander! Yes, the profile picture is from Preakness! Such a fun day. Were you at Preakness?